Due to the mayor's announcements and the impending impact Tropical Storm Nate may have on our community, we will be cancelling this year's Algiers Fest in the interest of keeping everyone safe and encouraging people to take time to prepare their homes and families. We look forward to seeing you all in 2018 and continuing to grow this event and support our military. We want to thank all of our wonderful planners, sponsors, and performers for helping bring this event to life over the past three years. 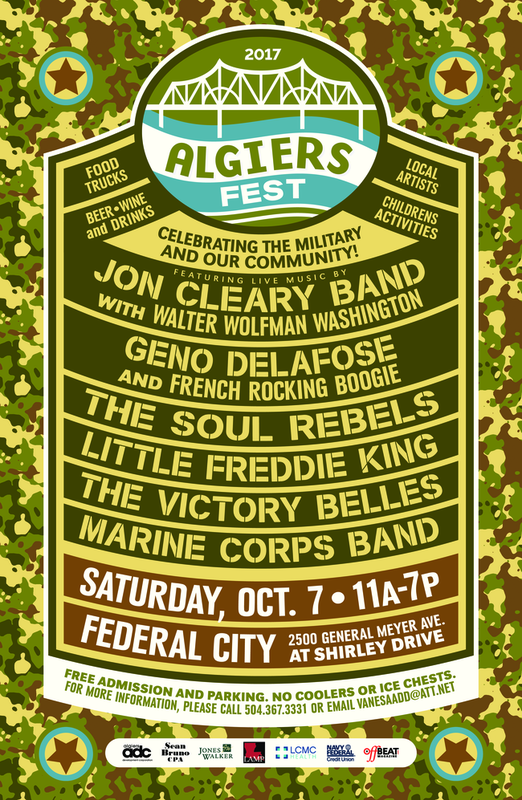 With hard work, dedication, and a love for both our military and our community, everyone involved has played an integral role in making Algiers Fest a success.